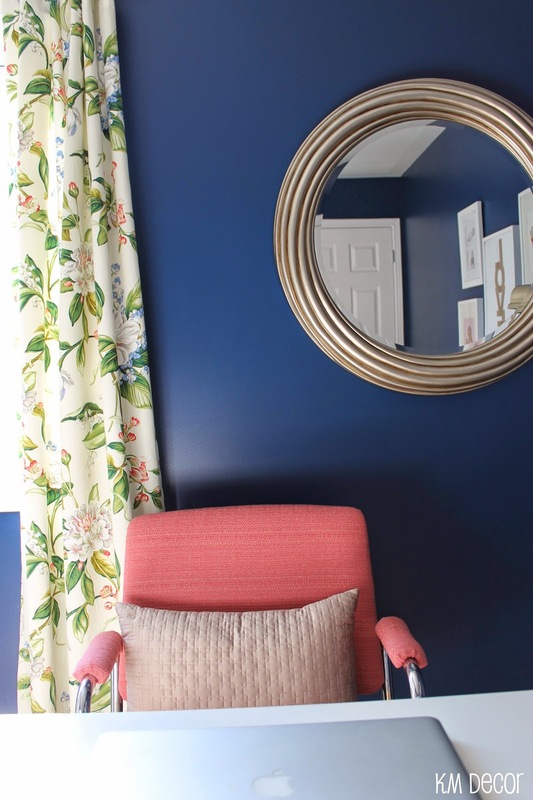 When it came time to makeover the smallest (and very empty) bedroom in our house into my home office last year, I knew that I want a space that verged on the side of girly and that inspired me when I worked in there. 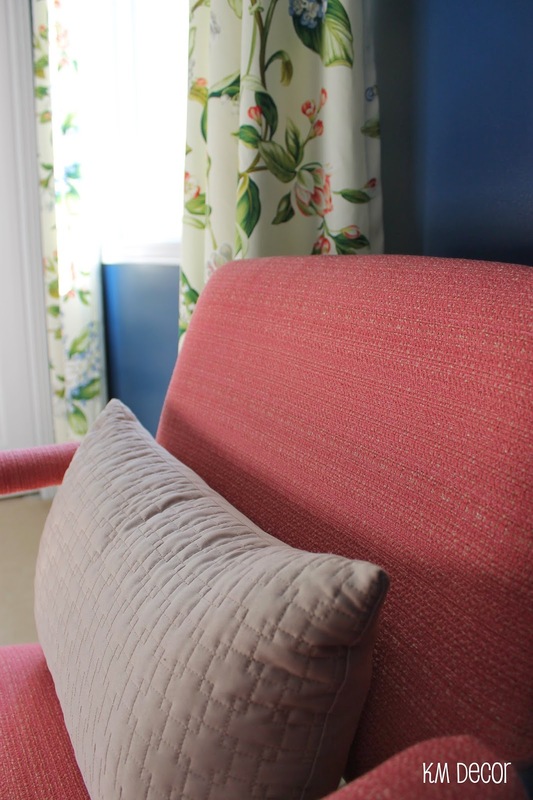 Much to my delight, my hubby had no problem with me making this space girly, complete with a pink desk chair and floral curtains. I didn't want to shove the desk up against a wall but rather float it in the middle of the room. And luckily having a laptop, an overhead light and a floor lamp made this possible. I decided to mix metals in this room also. I loved the look of the antique brass of the oversize round mirror and the curtain rod, but I didn't want to feel tied to that finish. In order to make the mixed metals work well, I made sure to use almost a 50/50 ratio of both antique brass and silver in the office. The curtains were hand made by my amazing and talented mother. You can read more about that here. The chair was a process and a half, but this $30 vintage chair looks perfect in a salmon upholstery. To the left of the doorway is a storage cabinet that holds my oversupply of decorating magazines and design books. 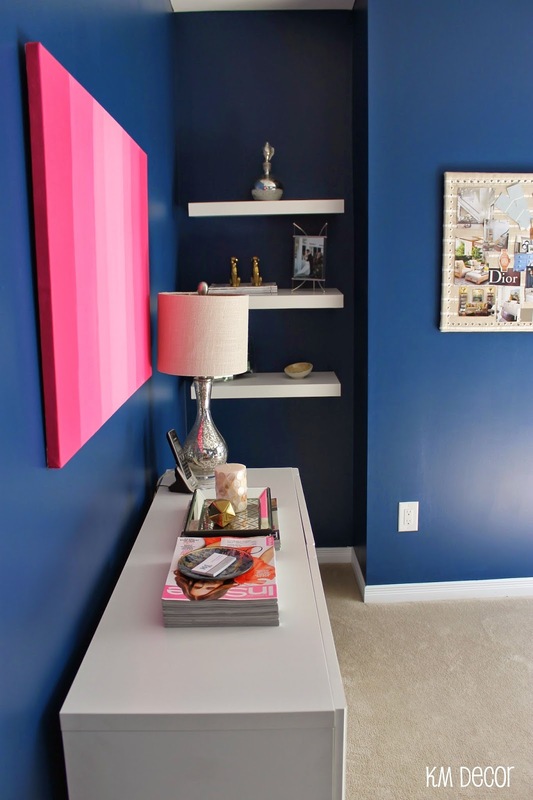 You can also see my DIY ombre art and DIY upholstered cork board. knobs on storage unit - Amerock "Allison"